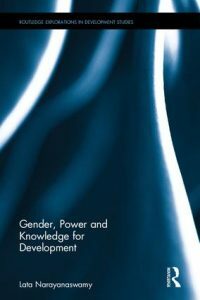 Gender, Power and Knowledge for Development is based on the author’s doctoral research, shining a critical light both on how the Knowledge for Development (K4D) paradigm set out in the World Bank’s 1998 World Development Report defined such knowledge, and on how it has since been enthusiastically promoted in permutations of K4D – such as ICT for Development (ICT4D), Communication for Development (C4D), and Knowledge Management for Development (KMDev). The World Bank’s paradigm was swiftly criticised as a neoliberal spin on whose and what kind of knowledge ‘counts’, based on a linear understanding of ‘under-development’ in the South resulting, in part, from lack of access to superior knowledge produced in the ‘developed’ North – a kind of ‘trickle-down’ approach to addressing structural inequality. The United Nations countered with a vision of a ‘knowledge society’, framed as economic and social justice and, if not two-way, rhetorically based on the assumption that the North has no absolute monopoly on ‘knowledge’. Lata Narayanaswamy’s argument is, however, that while K4D practitioners and agencies may believe that they are contributing to ‘locating and showcasing Southern knowledgeas a new engine of both economic growth and social development’, in reality ‘most K4D initiatives … are noteworthy for the lack of any systematic data to support the claim that improving information supply facilitates development processes’ (p. 3). Non-government organisations (NGOs), Southern and Northern, are assumed to act as ‘knowledge brokers’ or intermediaries, bridging the gap between formal (Northern) and informal (Southern) kinds of knowledge. This, in turn,has led to a proliferation of ‘knowledge products’, portals, low-bandwidth websites, and the like, giving prominence to ‘empowering’ marginalised women. Following an introductory overview, the author examines the theories – mainly beliefs – underpinning K4D, as well as aid agencies’ assumptions about (Southern) women and women’s NGOs, and about communication in relation to ‘inclusive’ development, however loosely defined. The main chapters comprise documentary and empirical research related to the Gender and Development Knowledge Service (GDKS), based in the global North, whose current ‘vision and mission are predicated on the need for more accessible information for policy-makers, practitioners and activists working on the interface of gender and development’ (p. 128). In her research in India among a large range of people in organisations that receive GDKS materials, Lata Narayanaswamy finds that, for them, the principal problem is not in fact the lack of access to but rather the surfeit of information. As one senior Southern NGO representative put it: ‘I feel I am suffering from information overload. I can barely deal with my e-mails, forget about the e-lists and then all the PDF files that are bombarding me all the time’ (p. 161) – an all too familiar experience. In other words, pumping out information creates more problems than it resolves. And this is before considering the role of language. The author points out that, in Hindi-speaking areas, oral and written Hindi is used to elicit information from and convey it to local women – who will not express themselves in the same way as ‘an educated New Delhi-based urbanite’ (p. 172), in addition to which the original materials intended to ‘uplift’ them may have been in English and translated into highly formal Hindi. In one case, an Indian GDKS partner could not communicate with local women because they spoke in a Hindi dialect she could not understand. Translation is expensive, the more so if it is of little use. As Lata Narayanaswamy concludes, often ‘translation is a proxy for inclusion without any opportunities for co-creation of meaning with target audiences … no room is created in this top-down translation model to sufficiently explore what gender as an idea might mean in a Hindi-speaking context, if anything’ (p. 175). As such, it merely signals the inclusiveness it cannot achieve. Then there is the issue of free-of-charge electronic communication provided by GDKS, which tends to go to resource centres in New Delhi, presumably for onward (that is, downward) transmission. But this does not happen. In fact, the main users appear to be PhD students and researchers (p. 186). ‘In New Delhi, not a single organisation I visited had anything less than the latest technological advantages, including the latest IT equipment with high-speed broadband connections’ (p. 187). This suggests that ‘whether ICTs and their associated infrastructure are suitably geared towards improving the accessibility and uptake of information is the wrong question’ (p. 246). Obviously, the same does not hold in rural areas, or among those with limited literacy, but the point remains valid. Moreover, many gender resource centres are located in ‘exclusive, residential areas and with no signage’ (p. 206), and charge membership fees, a type of ‘inaccessiblity [that] was surprising to encounter amongst Southern women’s NGOs, which retain an imagined capacity … to be more transparent, accessible and open’ (ibid.). The author’s sobering observations are that ‘donor funding exerts discursive control over knowledge processes’, including through mechanisms that might appear to support Southern research, but only within the donors’ predefined parameters: ‘funding some issues over others reinscribes the dominance of particular ideas and issues over others, effectively creating and then perpetuating hegemonic development discourses, and frequently in very subtle ways’ (p. 223), for instance by encouraging research bodies to ‘package’ their proposals in donor-friendly ways. In the absence of robust, or even rudimentary, monitoring and evaluation (M&E) systems, the assumption persists that ‘producing more and more information is both necessary and crucial, and the act of ensuring that it is out in the public domain is the most important outcome, whether or not it represents an expressed information need or, indeed, is useful to anyone’ (p. 231) – a perverse permutation of the ‘publish or perish’ imperative. Of course, Southern NGOs can and often do reach marginalised and grassroots women, ‘but it is less clear whether the grassroots is able to “reach” them or to reach policy-makers or other intermediaries such as GDKS through them’ (p. 234). NGOs’ role as gate-keepers, defining marginalised women solely in terms of what they will forever lack, merits reflection. As does the ‘neoliberal logic that transfers the responsibility to seek out and then act on information to those marginalised individuals least likely to be able, in the vast majority of cases, to capitalise on the potential opportunities offered by improved access to information’ (p. 251). Offering K4D services in a standalone and essentially paternalistic fashion is doomed to failure, the author concluding that marginalised people may in fact know what to do but face structural constraints to being able to do it. The book’s origins ensure that the author’s approach is both thoroughly researched and forensic in its detail, which doesn’t always make for easy reading. However, for me, along with many valuable insights, its critical contribution is to disrupt lazy assumptions that technical solutions laced with good intentions will ever bring about the kinds of structural changes required to achieve and sustain gender equality.